Are you familiar with the Belmond brand? I first encountered it a couple of years ago when planning my own trip to Peru. The Belmond name is inescapable in Peru, where they own six hotels (one of which is located right at the entrance to Machu Picchu) as well as two trains — The Belmond Hiram Bingham, which offers luxurious service from Cusco to Machu Picchu, and the Belmond Andean Explorer, which offers a variety of multi-day excursions throughout the country. 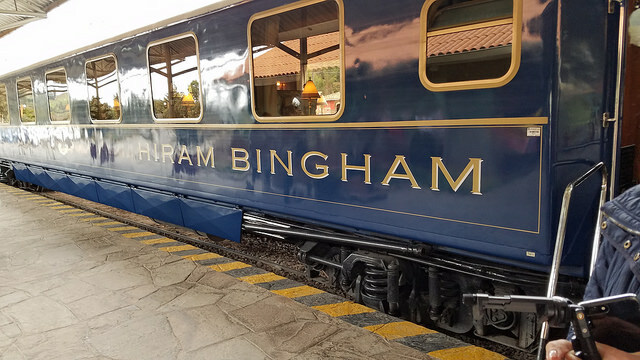 Because I was planning our trip only five months out from our departure, I had no hope of finding an available reservation at any of the several Belmond properties that were along our route, but we did take the once-in-a-lifetime journey on the Belmond Hiram Bingham to Machu Picchu. Because, if you’re going to see the Lost City of the Incas, you might as well do it in style, right? Since I returned from Peru, I’ve been fascinated with the luxury, service and history that is inherent in the Belmond name, and so I thought I’d share with you some of the Belmond properties that sit at the top of my drool-worthy travel list. Since my personal experience with Belmond began in Peru, I thought that’s where I should start this list. Belmond has six hotel properties in Peru — two in Cusco, one in Lima, one at Machu Picchu, one in the Sacred Valley and one at Colca Canyon. It’s tough to pick a favorite for this list, but I’ve decided to choose Belmond Palacio Nazarenas in Cusco. Featuring original Inca stonework combined with a cloistered courtyard with an ancient fountain at its heart, the Palacio Nazarenas is the height of understated elegance. 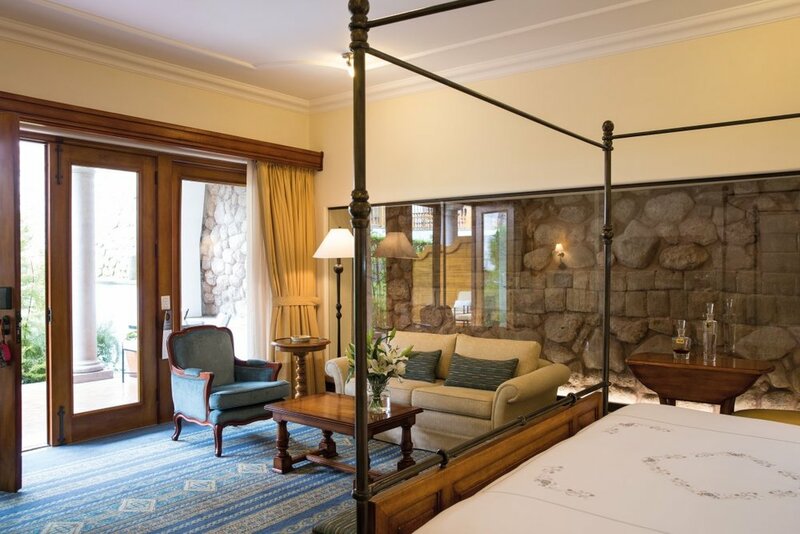 This former palace and convent is set in a plaza just behind Cusco’s main square and features 55 suites, each enriched with oxygen (to help prevent altitude sickness) and featuring a private bar. Belmond Palacio Nazarenas is also home to an amazing spa, the city’s first outdoor pool and restaurants featuring elegant local cuisine. Learn from my experience and book well ahead of time if you want to snag a room at this luxurious establishment. Mosaic World Travel special: Book the Belmond Palacio Nazarenas with us and receive exclusive rates as well as $100 spa services credit and complimentary WiFi. Book a suite and receive a complimentary airport transfer in addition to the other exclusive amenities. Belmond also has a significant presence in Italy, with six hotels and an iconic train. Again, nearly impossible to choose just one of their properties as a favorite in Italy, but the breathtaking Belmond Hotel Caruso, set on a cliff edge 1,000 ft. above sea level, over groves of lemon trees and olive vines, is a top contender. A former 11th-century palace, the Hotel Caruso was originally built by a wealthy family shipwrecked on their way to Constantinople. Today, its marbled hallways and vibrant frescoed salons feature antiques and paintings by old masters and invite exploration. The hotel’s 51 rooms feature hand-crafted terracotta floors, neo-classical antiques, fresh flowers and breathtaking views of the coastline. You can snag some amazing views from the infinity pool as well, which seems to be suspended out over the ocean. An in-house boutique features both hand-picked items and items exclusively designed for the hotel. The Wellness Centre offers an opportunity indulge yourself even further — perhaps try a massage in the privacy of the hotel gardens, surrounded by enchanting vistas of the sea. Mosaic World Travel special: Book the Belmond Hotel Caruso with us and receive exclusive rates as well as one lunch for two at the pool/bar restaurant, fresh fruit and flowers upon arrival, and complimentary internet access. Situated on a private island in the Okavango Delta, Belmond Eagle Lodge is no typical hotel and sits head-and-shoulders above many safari lodges. The lodge is comprised of just 12 luxurious tented rooms, each with its own private plunge pool and private views of the savannah. And, as you might have guessed, these are not your average tents; they feature air conditioning, fully equipped bathrooms with large tubs and both indoor and walled outdoor showers, a stocked minibar and daily laundry service. The lodge is one of Botswana’s original safari lodges and was recently fully renovated to provide a sleek new look. Public areas include a dining area with pizza oven, lounge area with an artisan-style bar, a library, a separate campfire area and the Fish Eagle Bar located directly on the water. This is the perfect spot to start your exploration of the delta, and the lodge offers motorboat safaris, barge cruises, mekoro safaris (in a local canoe), fishing, walking safaris, and an air safari by helicopter. Mosaic World Travel special: Book the Belmond Eagle Island Lodge with us and receive exclusive rates as well as a complimentary welcome drink on arrival and a complimentary champagne mekoro excursion. Also ask about our special multi-day packages with Belmond in Africa. In addition to its amazing historic properties around the world, Belmond also offers an incredible beach escape. While the company’s two properties in the Caribbean are closed for repairs after recent hurricanes (they are scheduled to reopen Dec. 2018), the Belmond Maroma Resort & Spa in Riviera Maya is open for business and dazzling visitors with its signature combination of pristine beaches and lush jungle. The height of barefoot luxury, the resort features 63 rooms that range from elegant to breathtaking and open to either the Caribbean or the jungle. A variety of contemporary Mexican cuisine and international specialties are served at the resort’s restaurants, which can be enjoyed a la carte or by purchasing an additional dining package. Relax on the powdery sand beach, gazing out over picture-perfect turquoise waters, or spend time at the resort’s Kinan Spa, where both traditional botanicals used in ancient ceremonies and more typical massages, sauna and nail services are on offer. For active visitors, the Maroma Resort & Spa is the perfect home base for sailing, biking, exploring ancient Mayan sites, swimming with whale sharks, snorkeling in a cenote, scuba diving, golf and more. Mosaic World Travel special: Book the Belmond Maroma Resort & Spa with us and receive exclusive rates as well as a complimentary 30-minute massage for two and fresh flowers in your room upon arrival. Upgrade to a suite and add a complimentary airport transfer to the list of amenities. The archeological wonder that is Angkor is a destination that tops any number of must-see lists. The sprawling complex draws more than 1 million tourists every year, and the Belmond La Résidence d’Angkor is the perfect spot to escape the crowds and cool off in exotic luxury. Located on the river about 15 minutes from Angkor Wat, this leafy retreat combines traditional Khmer tradition with contemporary style. Tucked among lush gardens, the retreat’s décor highlights local woods, laterite stone and decorative carving. The central pool is the perfect, quiet spot to cool off after a long day of exploring the ruins. The hotel is also home to two remarkable restaurants – Ember, which serves up Asian dishes with Latin flair, and Spice Circle, which offers a hawker-style dining experience that celebrates Khmer cuisine. The Martini Lounge is the perfect spot for sunset cocktails and tapas. Because the full experience of Angkor is important to guests, the hotel organizes tailor-made tours that enable each guest to have a unique experience and to take a step into the history and culture of Cambodia. Mosaic World Travel special: Book the Belmond La Résidence d’Angkor with us and receive a complimentary 50-minute massage for two during your stay. If (somehow) none of these hotels pique your interest, take a minute to click here and peruse the full collection of some of the world’s finest hotels, and find out what exclusive benefits I can offer as a member of the Signature Travel Network.